The speakers at this day's lunch meeting were members of the Burlington Police Department who told us about their new program within the department to assist the police officers in dealing with persons with mental health issues. To this end they have added Karen DeRenzo, a veteran mental health clinician and social worker who is a Burlington resident. She is working to establish relationships with several community organizations and also hospitals, all to better serve the needs of the persons in our community who require mental health services. 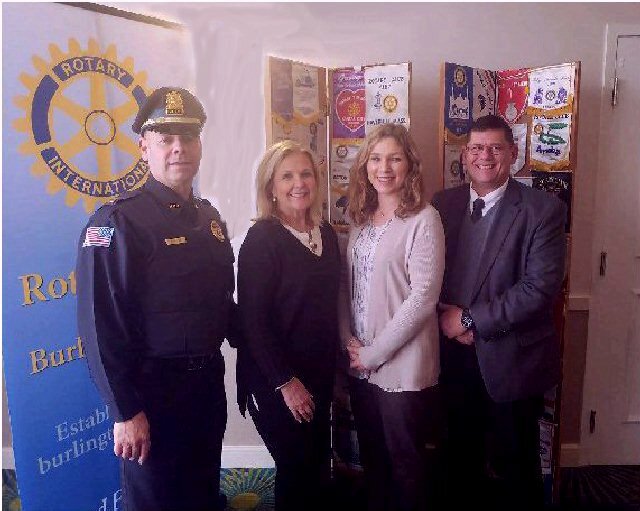 Shown are (l-r) Police Captain Greg Skehan who is in charge of the program, Club president Beverlee Vidoli, Karen DeRienzo and club memberJim Tigges, detective with the Police Department.